What I admire very much about this Max Bill design is its incredible airiness. From the font used to the balanced dial and the very thin rim around the crystal, it all fits. An architect turned industrial designer he must have been very much influenced by the Bauhaus educational surge that emerged in the early pre-WWII era. Very elegant and stripped from all that is unnecessary. IAmScott, Reflex, arogle1stus and 1 others like this. It is very minimalist for a chronograph for sure. I like Max Bill's primary-color, graphic artwork too, and have a clock designed by him. 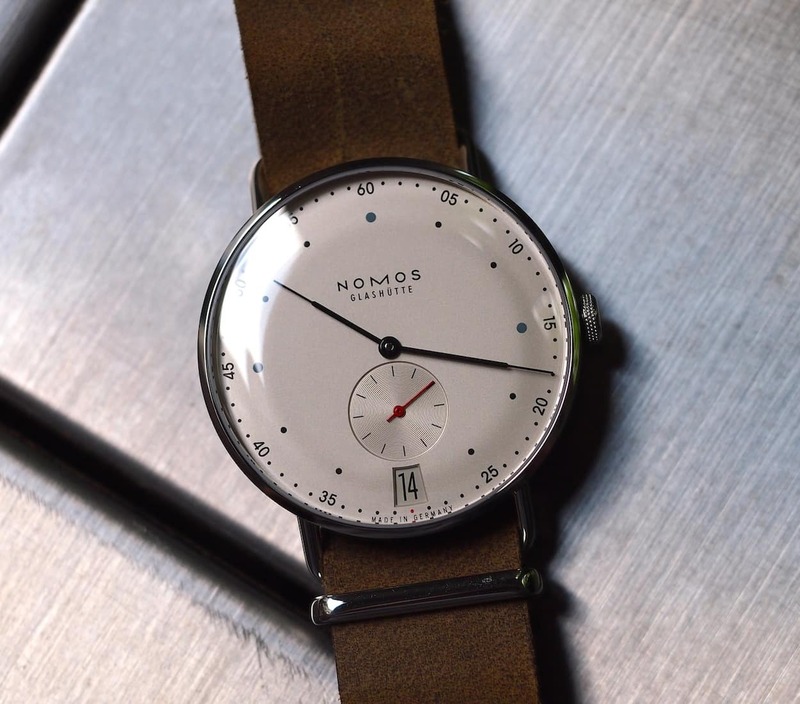 The chrono you posted reminds me of some of the NOMOS designs. GoodWatch, Reflex and dermouse like this. IAmScott and dermouse like this. Thanks for posting these. Very cool. My favorite is the first piece, on mesh. Really are so cool it's not even funny to tell the truth Frans. Thanks a ton for posting !!! Helsinki to Dallas next time we visit our son there. We want to visit the largest flower market in world in Amsterdam. much as we can do in 3 days. Saw Stockholm and Malmo last trip. Summer of 2019? Hope so. I'll tell you a little something. If you haven't booked a hotel already, now is the time to do so because if you wait, all the better hotels will be fully booked. They keep rooms free for those who just 'wonder in' but they charge up to a 100% above the internet booking price. What will be left are flee bags. In June, Amsterdam turns into a live spectacle amusement park with streets packed to the brim with (foreign) tourists. Drunk at 11.00 AM already and hoping to score drugs. I kid you not. Weren't it for your tight schedule I would advise you to visit Haarlem, Leiden or Alkmaar. Tourists, yes but on a much more civilized scale and behaviour. Alkmaar is the cheese town and Leiden is home to the oldest university in The Netherlands (1575). Coming May, my daughter and myself will travel to Haarlem and pay a visit to the Teylers Museum there and do some shopping. The museum contains antique scientific instruments, books, paintings and has a large fossil collection. Thanks for the lodging booking "heads up"
Planning to be in Finland for Juhanus, June 21st. Longest day of the year. So we'll need to book coinciding with that date. is Rotterdam? Bus or taxi service? From Amsterdam Central Station to Rotterdam Central Station it is about 78 kilometres, or 55 minutes by train. From Schiphol Airport to Rotterdam Central Station about 60 kilometres or 45 minutes by train, 22 by high speed. Do not take a taxi unless you are loaded because they will take you for a ride There used to be a bus service, good and inexpensive but that was run by KLM, now I’m not sure if there still is one. Takes too long anyway.